British fishermen are urging the Foreign Secretary, Anthony Crosland, to secure a 50-mile fishing zone around the UK. He is in discussion with other EEC foreign ministers at the Council of Ministers in Brussels to establish 200 mile fishing limits around all of the Common Market. They are meeting a month before the United Nations Law of the Sea Conference and before the expiry in December of the British-Icelandic agreement which ended the Cod Wars. The Director General of the British Trawlers Federation, Austen Laing has criticised both the previous Conservative and present Labour Governments for failing to protect the British fishing industry when the EEC Common Fisheries Policy is geared towards the interests of the original six members. "Under the present policy all Community vessels would have the same right of access [to British waters] as British vessels," he said. In the UK the industry employs about 20,000 fishermen and 100,000 ancillary workers and accounts for 60% of the EEC fish stocks. But Mr Laing explained, "We are a Cinderella greatly overshadowed by agriculture". Discussion in Brussels is concentrated on policy for the whole community, while the British Government is keen to establish individual rights within the group. Minister of State for Foreign Affairs Roy Hattersley said: "The Government's policy is to obtain for the fishing industry the best possible deal, within the revision of common fishing policy." Representatives from the UK fishing industry claim a 100-mile exclusion zone would provide enough fish for British markets and workers "to keep us going forever". But British ministers face a battle to increase EEC limits from the 12 miles the Common Market currently recommends for national limits. During discussions over the next two days the UK also wants to ensure restrictions apply to seabeds and not just waters to avoid the North Sea oil industry coming under EEC jurisdiction. 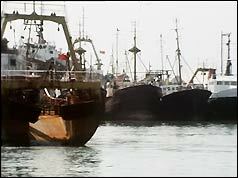 From the beginning of December 1976 British trawlers were banned from fishing within 200 miles of the Icelandic coast. This affected around 26 boats and a delegation from the British ports of Hull, Grimsby and Fleetwood went to Brussels to safeguard the 12,000 jobs involved. A new EEC Common Fisheries Policy became law in the UK in January 1977. The Fishery Limits Act extended British fishing zones to 200 miles with reciprocal rights within the EEC and with nine non-EEC countries. Iceland was not included because it was subject to separate negotiations with the EEC.